I know that the holidays were ages ago, but I’ve neglected to post the greeting card my boyfriend Jon and I made for my Montana relatives. San Francisco looms in the background with a silhouette of a tree chopping scene in the foreground. The mountains in the middle are part of the range that surrounds Helena, Montana that folks refer to affectionately as the Sleeping Giant. All the delicate little cuts and lines were created in just 3-minutes per card thanks to laser cutter that traces the lines of a vectorized version of the hand drawing (entirely drawn and vectorized by Jon). Such a fun and satisfying machine to use! 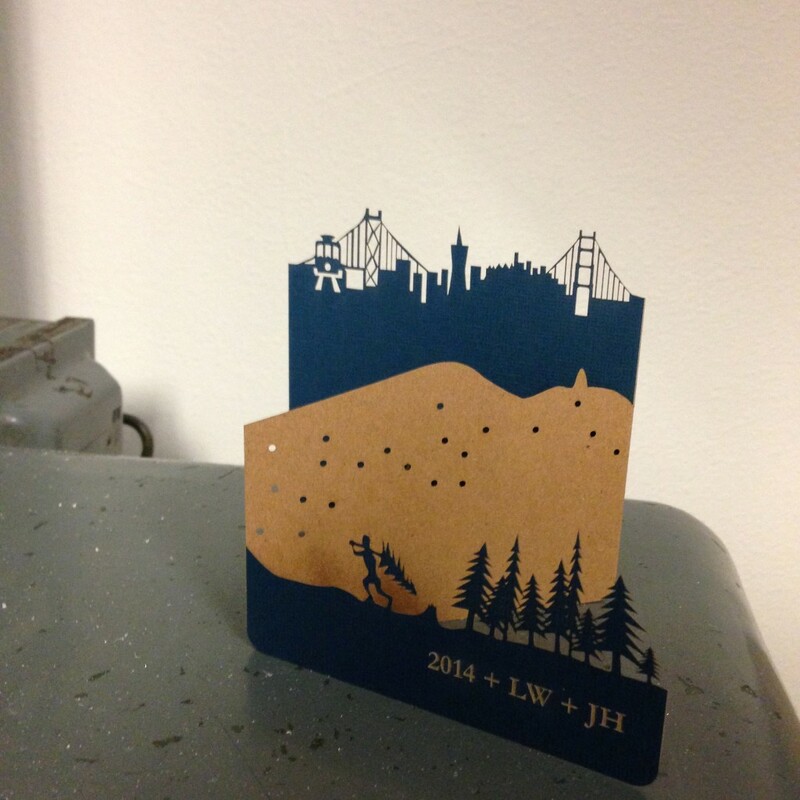 I’m hoping to do more laser cut projects in 2015. See the laser cutter in action at facebook/lizworthyart. While this is the only laser cut card out there with my name on it, I’ve been working hard promoting my other more traditional cards. Eleven of them, mostly from my SF situations series, will soon be on the card racks at Needles and Pens. This is a great Mission store that has been around for ages and has recently moved from a nook of a location at 16th and Guerrero on over to Valencia Street between 22nd & 23rd Streets. I’m excited to see them doing well and excited to be on their shelves! 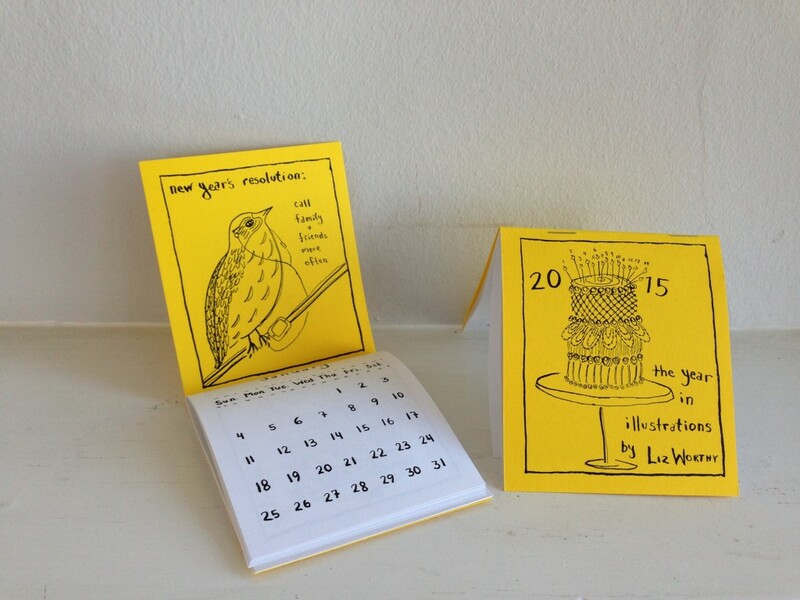 My annual calendar is already in its second printing! This year’s theme is a little looser than past themes. I used pictures that I’ve been working with to develop a line of greeting cards and coupled them with fun words and phrases. January’s words are a reminder to be in better touch with the folks I love. February will give you a taste of the best medicine. March, well, just beware. April is a 2105 check-in. May, a swim with mermaids. June will tell you all you need to know to shake up a Last Word cocktail. July may make you never want to play the game Jax again. In August I ask a very personal question. September reveals how old I am. October is for the birds. November delivers words of caution, should you try to deep fry a large bird. December is all about bubble wrap and packing peanuts. Find me or get one while they last from my Etsy store.